Growing up in an Italian family, I’ve been eating ricotta cheese since I was able to handle solid foods. However, until recently, ricotta has always meant savory foods. Lasagna… manicotti… stuffed shells… ravioli… you get the picture. It was always a savory dish, and 9.9 times out of 10, it involved red sauce. It wasn’t until a few years ago when I had sfogliatelle and homemade cannoli and that I experienced how wonderful ricotta could be in a sweet recipe. 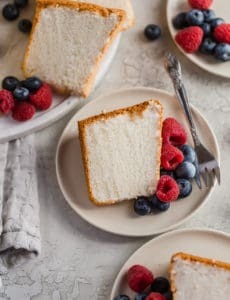 A few weeks ago, I came across this ricotta cake in the Wall Street Journal and loved the idea of a ricotta-style cheesecake. 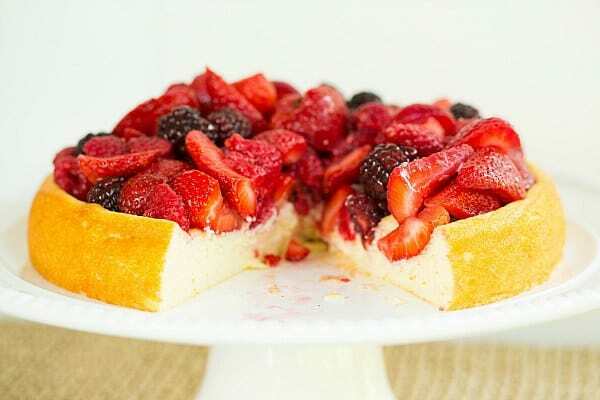 Topped with fresh berries, what could be better? This cake did not disappoint; the texture was wonderfully silky smooth, and the flavor slightly sweet with a punch of citrus. It makes a great, light dessert to cap off a summer meal. The recipe for this cake states that freshly-made ricotta cheese is best for the cake due to the texture. I did not make ricotta from scratch, but the cheese department at my local (pretty large) supermarket makes its own fresh ricotta, so I bought a pound from there. I’m sure you could find fresh ricotta at any Italian grocery store, as well. I didn’t try this with commercial ricotta cheese, but I think it would still work, the texture just might not be exactly the same. Now I know what’s next on my DIY list – homemade ricotta! How do you like your ricotta recipes – sweet or savory? 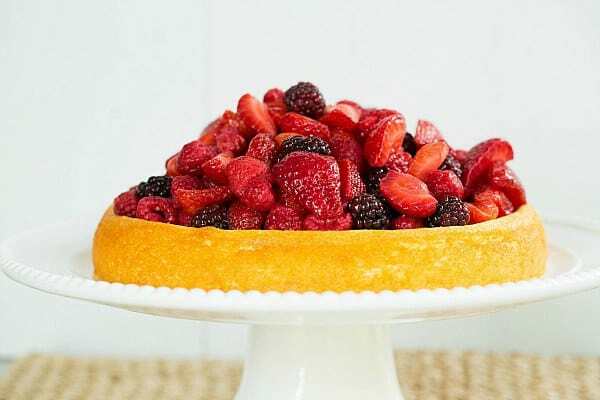 A light ricotta cake topped with macerated mixed berries. Prepare the Berries: In a medium bowl, gently toss the berries with the sugar. Let the berries macerate while the cake is made. Make the Cake: Preheat oven to 350 degrees F. Butter a 9-inch springform pan; set aside. 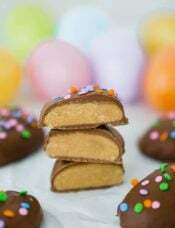 Add the cake ingredients to a food processor in the following order, pulsing briefly after each addition: sugar, egg yolks, ricotta, mascarpone, flour, baking powder, orange zest, Grand Marnier and salt. After all of the ingredients have been added, blend until smooth, about 20 seconds. Transfer to a mixing bowl and set aside. Using an electric mixer, beat the egg whites until just short of stiff peaks. Gently fold the egg whites into the batter. Pour the batter into the prepared springform pan. Bake until the center of the cake springs back when touched and appears just set, 45 to 50 minutes. 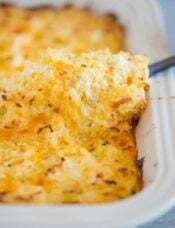 Allow to cool slightly before releasing the sides of the pan. Allow to cool to room temperature. When ready to serve, drain the berries in a colander. 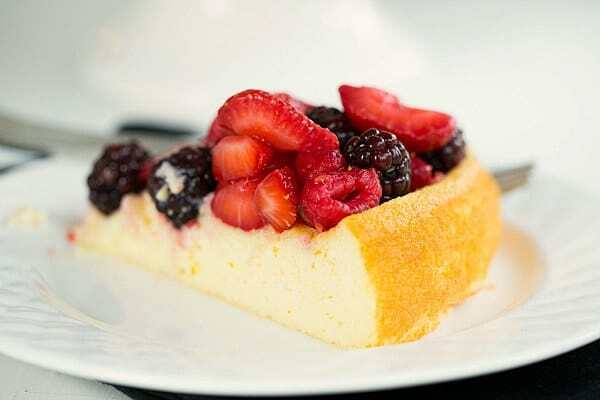 Serve at room temperature topped with the berries. 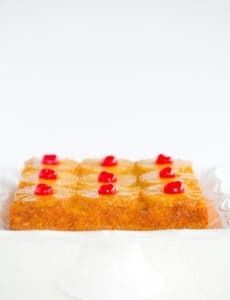 The cake is best served shortly after making, although you can keep it at room temperature or chilled for up to one day, but only top with the berries just before serving. This was an easy cake to make and it was definitely a hit in my house. It was moist and fluffy at the same time. I did not have any grand marnier, so I used two tsp. orange juice instead. I have made this about 3 times, and I no longer think it’s worth my time. It tastes good, looks pretty good; but will never come out like yours. Or any other homemade ricotta cake recipes. And I think it comes down to the truth of your statement of using fresh ricotta. I cannot get it in my neck of the woods, it’s a 3-hour trip ONE WAY to get to the closest place that sells it. So if anyone else has made this with commercially made ricotta and had great success, please let me know what you did. Because I think the fault is clearly not with Michelle or her recipe, but with the ingredients available. I made this for a dinner party last night. I probably would not have given this a shot because I believed cream cheese should be used on cheesecake, but the mascarpone made me very curious. I love this texture and taste! I was so happy with the result and my guests loved it:) thank you! 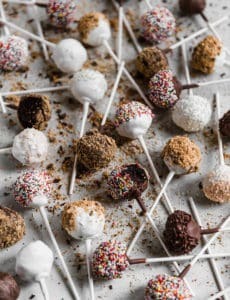 This is my absolute favorite baking blog! I made this for my daughter’s in-laws, who are from Italy, and it was a HUGE hit! 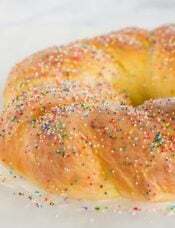 They are gluten sensative, so I also follwed Kerrin’s suggestions suggestions for a gluten free cake. Everyone still loved it and one man even said it was the only birthday cake he ever wanted from now on! 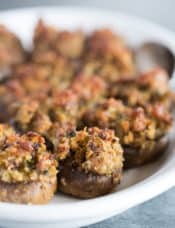 My father had seen this recipe and had asked me to make it for our family’s labor day celebration. This is a very light cake – the beaten eggwhites make it almost like a soufflé. The orange peel and the orange flower water make it highly perfumed and almost cloying. If I make this again, I’d put some lemon zest instead of all orange and cut the flower essence by about half – maybe put in some vanilla too. I’m thinking that using half ricotta and half regular cream cheese might make it creamier and not as fluffy. I also compoted some blueberries instead of the sugared fruit. ricotta’s berry cakes are so delicious. I like it. But how to make joint berry’s one another? 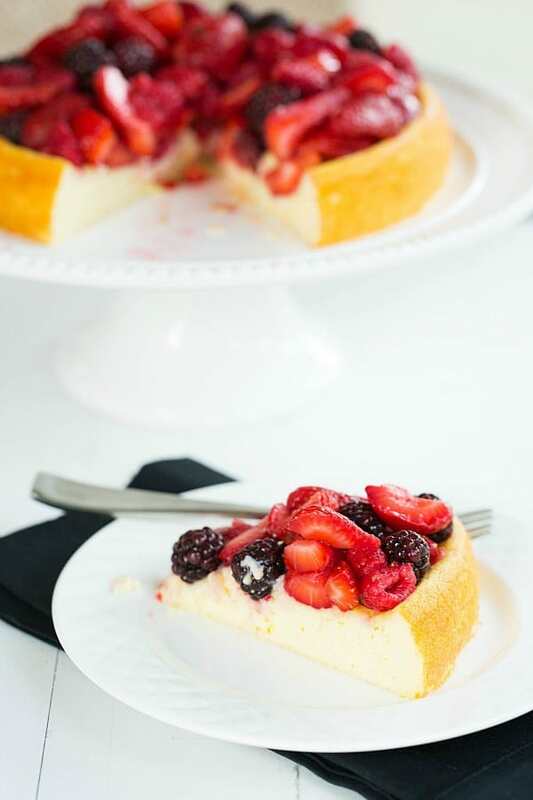 I love the idea of the fresh berries but have been making this cheesecake for 20+ yrs. The ricotta is the secret ingredient for the light texture. It truly is wonderful. This sounds amazing! Sweet or savory I love ricotta. 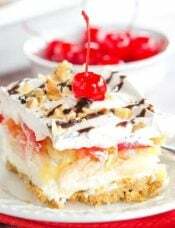 On one of her episodes, I had seen Giada DeLaurentis spread some ricotta on a plate then sprinkle sugar on top and explain that this was a treat for her as a kid growing up. OMG it is the best! I will buy ricotta just to have a little treat with some sugar. So good! I have to try this cake. Thank you! This looks absolutely incredible! What a beautiful dessert for a dinner party or family gathering. Definitely bookmarking for later! The berries on top look amazing! 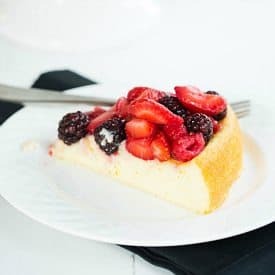 I’ve wanted to make a ricotta cheesecake for a while – this is stunning with those fresh berries! Any chance you have a substitute for the eggs?? 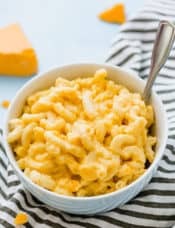 One of my twins is allergic and I’m always looking for ways to make classic recipes without the eggs. This looks delicious!! Thank you! Hi Nicole, Ack, unfortunately, I do not. I’m not sure if an egg substitute would work or not. If you try one that you have success with, please feel free to share it! So pretty! This looks SO delicious – I love fresh ricotta. The photos look amazing! I’ve just found a recipe for making ricotta at home (so I can have it absolutely fresh) and the recipe makes 1 cup of cheese. Do you have a measuring cup conversion for 1# of ricotta? THANKS! Hi Christine, 1 pound of ricotta would be 2 cups in your measuring cups. Enjoy!